The Black History Month 2018 theme, “African Americans in Times of War,” marks the 100th anniversary of the end of World War I and honors the roles that black Americans have played in warfare, from the American Revolution to the present day. We feature alumna and service member Coretta McAllister. What do a military career and a passion for philanthropy have in common? A lot, according to U.S. Army Staff Sergeant Coretta McAllister, B.A. ’15. Service is a central theme in McAllister’s life, infusing her military, professional, and volunteer roles. “I first became interested in philanthropic studies when I met my professor, Dr. Genevieve Shaker, in the ‘Giving in America’ class. I was instantly transitioned into the field of giving,” McAllister says. McAllister works as the community outreach and volunteer management VISTA for Louisville Mayor Greg Fisher’s Office for Safe and Healthy Neighborhoods, where she’s responsible for developing and implementing the One Love Louisville Ambassador Program. Last May, McAllister graduated from Campbellsville University with her Master of Social Work degree. She plans to obtain her CSW and apply to an Army Social Work Internship Program that will equip her to become a Licensed Clinical Social Worker (LCSW). She will then be an active duty soldier working as an LCSW. She also plans to either start her own nonprofit or serve on the boards of nonprofit organizations. 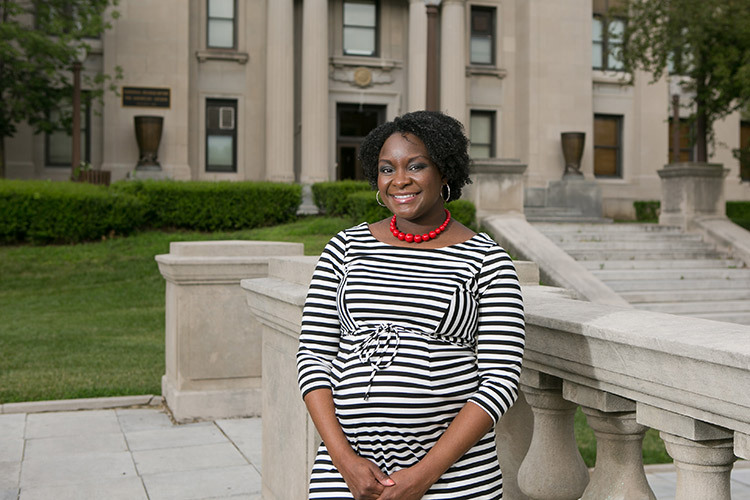 Adriene Davis Kalugyer is the manager of public affairs for the Indiana University Lilly Family School of Philanthropy.